Across the Street from the beach! Beautiful and New! This is not a party house. If you plan to party, you are definanly not welcome at this property. Bedroom : King size bed, ceiling-fan. Bathroom : Tile bathroom with towels. Living room : Limestone floors, Queen size sleeper, plasma TV, Verizon fiber optics cable, ceiling-fan. 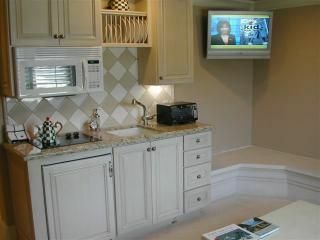 Kitchen : Granite counter tops, Toaster-oven, refrigerator, cook-top-burners, microwave, coffee maker, cooking utensils. This is a fantastic place to stay - close to both the Hermosa and Manhattan Piers. It's also far enough away that if you want a spot to yourself on the beach, you can do so. Just a few steps to the strand, and groceries/restaurants are not far, either. Very close to LAX you can use the public transit to this location from the airport. One block above the beach, in a very nice neighborhood. The parking pass was included. The apartment is very clean and the king sized bed is very comfortable. Nice and cozy! Steps to the beach! My husband, our 2 small grandkids (4 & 8yrs) and I stayed for a week at Doug's apartment. It's across the street from the stairs to the beach. It has one bedroom (with closet and washer/dryer stack), one bath w/shower, and a pullout couch in the living area w/sink, stove top, micro & mini fridge. Unfortunately, it was extremely tight for the 4 of us for a week. When the couch is pulled out, there is no place to sit or walk around. It would be okay for a day or two, but that's about it. It's really good for 2 people that like to eat out. There's no A/C and it was warm, so we had the windows opened, but it was noisy since the bedroom window faces the alleyway. Parking is easy to find near the apartment w/the provided pass. Restaurants (North End Bar & Grill is very good) and grocery are nearby. It's halfway between Hermosa & Manhattan piers, which are each a mile walk. Rok Sushi Kitchen has excellent food & happy hour and Cafe Bonaparte has delicious pastries & coffee, both on Pier Ave/Hermosa. The Comedy & Magic Club is a fun night out! Overall, it was clean and maintained, however it took us almost a month to get our deposit back. We just returned from a second visit to Doug's beach rental. Everything was perfect from start to finish. The apartment is located right across the street from the beach, making it super easy to just walk over and have a swim or watch the sunset. Easy parking, super clean. Many restaurants within walking distance. Also, Doug is a great host, always available for questions or assistance. Highly recommend if you are looking for a great place to stay at the beach. Can't wait to go again. Thank you Doug! This was the perfect place for a summer rental. It was very clean, close to the beach, and there was no difficulty finding parking. I highly recommend it! Doug was also great in answering any questions in a timely manner. Thank you! I really enjoyed this place. As stated it is very modern and clean. It's great for 1-3 people who want to be close to the beach and within walking distance of shops, restaurants, and bars. It's about half way between Hermosa and Manhatten Beach piers. You can't go wrong with this property. Magic Club with Jay Leno. and Trump International Golf Course. Disneyland, Knott's Berry Farm. This is not a party house. If you plan to party, you are definatly not welcome at this property. $1500 to 1750 per week depending on the time of year.